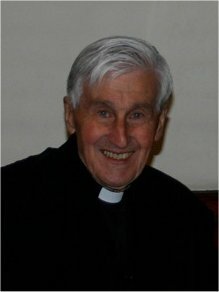 Others have written about Fr Hugh's life far better than I could, about his conversion, his time as a prisoner of war, and as a working priest in Brixton. So I thought that I would simply write a personal memoir about my experience of that very remarkable man. When I think of Fr Hugh Thwaites, the word that comes most readily to mind is 'simple'. Not in the sense of stupidity, not at all, but in the sense of uncomplicated directness. In this he was a true son of St Ignatius; for Fr Hugh, there never seemed to be any shades of grey. Instead he worked out in his own mind what needed to be done, and simply did it without regret, without considering how that might affect his own dignity or position. His decisions were easily made and steadfastly adhered to. His opinions likewise were simply arrived at and adhered to with ardour. About his Ignatian directness; I remember on that same retreat (he was conducting it for a group of English priests in a French monastery) he, smiling gently as ever, said 'I'm going to talk about hell now; I always think I should talk about hell on a retreat.' We all smiled to each other tolerantly and relaxed back. I shall never forget his opening words; 'Most priests go to hell'. Well you don't forget words like that. And in the same gentle smiling way he went through the scriptures and the lives of the saints underlining the reality and the appalling nature of hell. Our tolerant smiles tightened, then froze, and then went into rictuses of horror, because we were (and are) all believing and traditionally-minded Catholics who naturally profess the existence of hell—we would just rather think about something else. He knew that we really needed to confront the reality of the consequences of a sinful life. I didn't agree with him about everything. I remember being quite shocked at his policy of instructing converts (of whom he had many quiversful). 'I simply tell them how to pray the Rosary', he said. 'It's got everything they need to know in it.' I still prudently doubt the wisdom of this. But then wisdom was not really one of his specialities. He had something much better; holiness, and I think that that was the thing that attracted people. I can think of three English Jesuits that I have admired (I have only known a few Jesuits); Fr Hugh, the late Fr Paul Crane, and the living Fr John Edwards. All three have, or had, a quirkiness which one might better define as a single-mindedness of purpose that sees a goal and simply goes for it, ignoring the details if they seem to distract from the end. Fr Hugh's inadequate instruction and his work in Brixton, Fr Paul Crane's highly independent apostolate of Christian Order and at Claver House, Fr Edwards' cavalier approach to the rubrics with his mini-Masses. In some ways, this seems to be so typically Jesuit in a way admirable, and in another way, not. I have in the past likened the Jesuits (at their best) to the buttresses of a great Cathedral. If you are inside the building, the buttresses seem to be outside, doing their own thing. If you are outside, you can see that actually they are keeping the whole thing standing up. Which is why the Jesuits have been feared and mistrusted both inside and outside the Church down through the ages. And the Jesuits' great perception, inherited from St Francis Xavier, that the souls in Brixton or Uganda or China are of equal value to the souls in Sunningdale or Ascot in the eyes of our Lord, is something that the Church needs to keep reminding herself. 1) That hell is real, and a greater possibility for us who are pastors of the Lord's flock. 2) That all souls are created in the image and likeness of God, and have equal value. 3) That prayer is much more than the acquisition of a technique; it is not something one has to be 'good at'; it is something one simply must do. 5) The importance of acquiring the virtue of humility. Father, your 'personal memoir' is a beautiful obituary to Fr Thwaites and gives an insight which official fact-filled obits cannot do. Thank you. I came across his talks on his wartime captivity on the internet some time ago and have been mesmerised by them. Interesting to note his approach to instructing converts. Although I do treasure my Rosary I am not sure how I would have reacted if I had been instructed by him! I don't remember even being taught how to say the Rosary in my instruction nearly 50 years ago and although I welcome the opportunity of praying the Rosary with others, my lack of concentration prevents me from praying it on my own. Perhaps I ought to take the advice of Fr Thwaites and try harder? Dear Fr, I have read with interest your tribute to Fr Hugh Thwaites. He sounds a wonderful man and a wonderful priest. I was a little shocked at his assertion, 'Most priests go to hell'. As an introduction to his talk I can understand why it got everybody’s attention. But seriously, how can he know this? Fr Robert Barron (wordonfire.org) recently gave a talk on video, commenting on the question ‘Is Hell Crowded or Empty?’. Without denying the doctrine of hell, and without encouraging any sort of complacency, Fr Barron finishes, quoting Hans Urs von Balthasar, with the comforting conclusion, ‘We may reasonably hope that all people will be saved’. I have not known many priests, but of those I have I hold in high regard, and if most priests go to hell, then what may the rest of us reasonably hope for? I would concur with your assessment of the rosary's value having been compelled to participate in it daily as a child. It was an experience which I would not impose on any child. Dear Father, thank you for your beautiful memoir. It was my privilege to meet Father Hugh a few times. The advice that he gave me was prompt and clear: he said what he would do in the situation, and then why. He also gave me a gentle hint about a matter on which I had not consulted him: I was too dim to catch on at the time, to my subsequent regret. He seemed with his beautiful eyes to be looking upon things that others could not yet see. I wish I had known Fr. Thwaites. He sounds like the epitome of what a priest should be – especially as regards holiness and humility. I suppose we all have known priests like him - unfortunately, too few in number. I don’t know about most priests going to Hell, but I have heard quotes about the road to Hell being paved with the skulls of bishops! So perhaps it is not an idle assertion. Some time ago I heard about a devotion for the souls of priests in Purgatory. I was taken by it and have followed it ever since. It is to recite 7 Our Fathers, 7 Hail Mary’s and 7 Glory Be’s, along with the Creed for 30 days continuously. I was so impressed by it that I have taken to pray it every day, regardless of the 30 required. As a laicized priest (by my request, many decades ago…) I have a vested interest in it! I am always struck by Our Lord’s words that: “To whom much is given, much will be expected.” And all priests have been given much – so Purgatory seems inevitable for many – or most? – of us. To Pelerin: don’t give up on private Rosaries because of a lack of concentration. As someone once said: “There are no wasted Rosaries…” The will to devote that time to it is not lost – even if the concentration is lacking. I too find it difficult to pray the rosary. I remember though Father Thwaites pointing out that it a very good reason to pray the rosary is that it "drives the devil mad" because you are constantly repeating the name of his two most feared adversaries, Jesus and His mother. I remember him encouraging me to pray it and discovering that whilst driving round the M25 I would only pass two junctions in the time it took to pray the whole rosary, which was not much of a burden really. His achievement was getting white van man praying the rosary. Although sadly I have not been very good at keeping it up and with the kids we find a decade is about as much as they can take without the whole thing descending into farce. We still have a rosary in the house that he gave us. He used to always carry several on him and give them out freely. Fr John Edwards SJ is to celebrate a Low Mass for the repose of the soul of Fr Thwaites in the church at Farm Street at 2 o'clock on Tuesday, 11 September, by permission of the (new) parish priest. He promises some good anecdotes! For some reason the print is really small in your comments box when typing on an iPod . Very difficult to read and i can't t expand iit Is it fixable? Thanks very much for this beautiful obituary. I was lucky enough to meet Fr. Thwaites when he was at Brixton. I was then an undergraduate. I had a couple of friends who were members of Opus Dei and collaborated with Fr. Thwaites. They asked me to give them a hand in the Brixton mission. I was not too thrilled about the prospects of spending half of my weekend there. And then one of them said: "Wouldn't you want to meet a living saint?". My friend lives in Scotland now. I have just given him a ring to share the sad news and thank him for introducing me to Fr. Thwaites. A saint, no doubt.